MOSCOW, Russia -- Ukraine will not be able to join the Customs Union (CU) after signing the agreement on associated membership in the EU, Russian President Vladimir Putin said at a press conference, following the meeting of the Supreme Eurasian Economic Council in Minsk. "No, impossible," Putin said when asked about such a possibility for Ukraine. At the same time, Russia is not going to interfere in the process of Ukraine's European integration, the Russian president said, adding that Moscow was "neither for, nor against it." "This is not our business at all. This is a sovereign right of the Ukrainian administration in the face of the president, the parliament and the government," he said. According to Putin, the impossibility of Ukraine's accession to the CU lies in the creation of a free trade area between Kiev and the EU. From about 10,000 import customs tariffs, Ukraine would have to reset 7,000 as soon as the agreement comes into force, which is to happen in February next year, Putin said. In another three years, he added, the openness of the market will be on the level of 85.5 percent, and 98.5 percent - a few years later. "This openness of the market is very dangerous for us and is not acceptable at this stage of our economic development," said Putin. Russia, in the long term, aims to create common Eurasian economic space from Lisbon to Vladivostok, but it must be all coordinated and conducted gradually, he added. To crown it all, another obstacle for Ukraine to become a simultaneous member of the Customs Union is the fact that Ukraine will have to follow technical regulations of the European Union. As a result, almost all goods produced in Ukraine, will be subject to EU rules. According to experts, this will require an investment of about 100 billion euros ($138 billion). Kiev does not have such sources, Putin said. In his view, it could oust Ukrainian goods to other markets, primarily to the CU market, which would require measures to protect it. There will be no ban on the importation of goods, but these products will no longer enjoy preferential treatment under a free trade zone. Putin also said that the goods will be regarded as "made in Ukraine" even when they are produced from the parts made ​​in the EU. "It's called a screwdriver, screwdriver assembly. 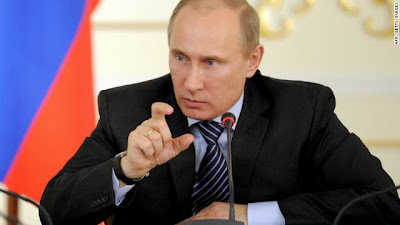 We do not want to have screwdriver assembly on our territory on a massive scale," Putin said. "We do not want a gift in the form of a screwdriver from the back porch," he stressed. The president believes that such a state of affairs may complicate cooperation between Russia and Ukraine in the field of aviation, aerospace, shipbuilding and mechanical engineering. Kiev also agreed to fully open and liberalize the market of agricultural goods for the EU, Putin said. Russia can not "take it all personally and have it all transferred to the Russian territory," the president said. Earlier, Prime Minister Dmitry Medvedev also stated that Ukraine would not be able to "sit between two chairs" - to sign the agreement on associated membership with the EU and join the Customs Union. The prospects for the European integration of Ukraine have repeatedly become a reason to exchange threatening statements from the authorities of the two countries. Two weeks ago, for example, Ukrainian Prime Minister Mykola Azarov said that in the next few years, Kiev may completely refuse from gas imports from Russia. In response, Russian presidential adviser Sergei Glazyev did not exclude the introduction of visa regime with Ukraine in connection with the "integration process." This week, it was said that convicted former Prime Minister Yulia Tymoshenko may save Putin from "geopolitical defeat." Her case may impede the European integration of Ukraine. In the EU, they believe that Kiev has not reached necessary progress in the quest to meet the criteria for the signing of the Association Agreement with the EU. The main complaint from the EU is the refusal from Ukrainian President Viktor Yanukovych to pardon Tymoshenko. Meanwhile, members of the Customs Union speculate which countries may join the association of Russia, Belarus and Kazakhstan. According to Kazakh President Nursultan Nazarbayev, the organization may have another member - Turkey. According to the Rossiyskaya Gazeta, the Customs Union, in addition to Turkey, is of interest to Armenia, India, and even Syria. "They say that Syria wants to join the Customs Union. Turkey is a big country, we have a common border with the country. This would brush criticism aside, because no matter where you go in the West, they ask questions of whether we are rebuilding the Soviet Union or creating something for Russia? Maybe Turkey's move to join the CU would put and end to these questions," the Kazakh president said. "Another major economy, India, shows the same interest," Putin noted in his turn. Due to the "pragmatic" position of Russia on the issues of pricing strategy of Gas supply to Ukraine and it insistence that Ukraine will not be able to continue its benefits from observer status of CU, Ukraine should consider some practical steps and put the end to the support of Russian initiatives on International arena until Russia shows some friendly moves by revising the Gas contract. Ukraine must find some ways to show, if Russia serious about friendship she must act accordingly. Also, Ukraine must make quick move on LNG project with Turkey before window of opportunity is shot. After Ukraine sign the AA agreement it may slow down any support of Russia for its exception to EU market, unless Russia provide benefits to Ukrainian products in the CU area. After prolong unjust treatment of Ukraine with the 2009 Gas contract, Ukraine must seriously and quickly start negotiations with Qatar for an interest free or low interest loan to complete LNG receiving terminal of Qatar's LNG and ask US to broker the deal with Turkey to allow LNG through. An idea developed by Robert Bensh has all merits. Ukraine has no intention to seat between two chairs, Ukraine must be a European country for one simple reason; that, joint Slavic civilization with Russia is not joint, it is a roll of slave state for Ukraine, where mainly human resources are drained and Ukraine has no word to say in this civilization. Regardless of Mr. President V.Putin's rhetoric which provides an appearance of common sense, Russia is not treating Ukraine on equal basis. Good example of equal basis would be relations between Britain and USA. Current Russian actions target its own benefits which should be a normal act for any country but, with one nuance DO NOT MAKE PROFIT ON THE SUFFERING OF YOUR FRIEND. Good deeds must be done with good consequences. USA should not treat Russia as equal partner until Russia treat its only true friend Ukraine on equal basis.